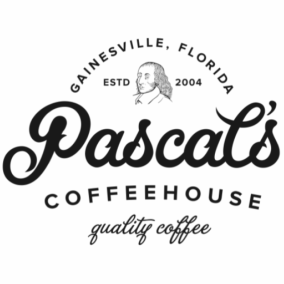 Pascal’s Coffeehouse is proud to serve Ceremony Coffee Roasters. Ceremony sources clean, bright coffees and seeks roast profiles that highlight the unique characteristics of each crop. Roasting out of Annapolis, Maryland, Ceremony strives to give coffee drinkers life-changing encounters with each coffee. Based out of Jacksonville, Florida, Bold Bean is committed to bringing out the greatness in every coffee bean. Functioning with the belief that each bean has a unique flavor profile inherent to it, the folks over at Bold Bean strive to hit this sweet spot every time they roast. All of our drinks are hand crafted by our baristas with care and integrity. We value customer satisfaction, and we believe that satisfaction is achieved by enjoying the best quality product, not by getting the fastest cup of coffee into your hand and out the door. You can rest assured knowing that while you may wait an extra minute or two for your drink, what we serve you is a carefully hand-crafted drink made with exceptional coffees.